High-end software for classic black-and-white photography. For your best black-and-white photos ever: Silver projects premium delights passionate photographers with a huge range of filters for converting your color photos into impressive, intense black-and-white images. Redefine your photos! 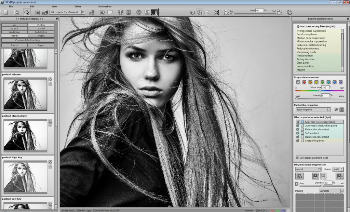 Silver projects premium puts an end to gray, flat images by using all the contrast and brightness information offered by modern black-and-white photography. The finest details within all tonal values guarantee high-quality results, even with difficult subjects and lighting conditions. Experience unprecedented freedom when trying out different looks: 33 intelligent presets and a toolbox of professional effects help you to create images ranging from reality to artistic emotion, that do more than just inspire. – Create your own presets and exchange them in forums!